Stock freshly made from roasted chicken left overs plus left over meat. 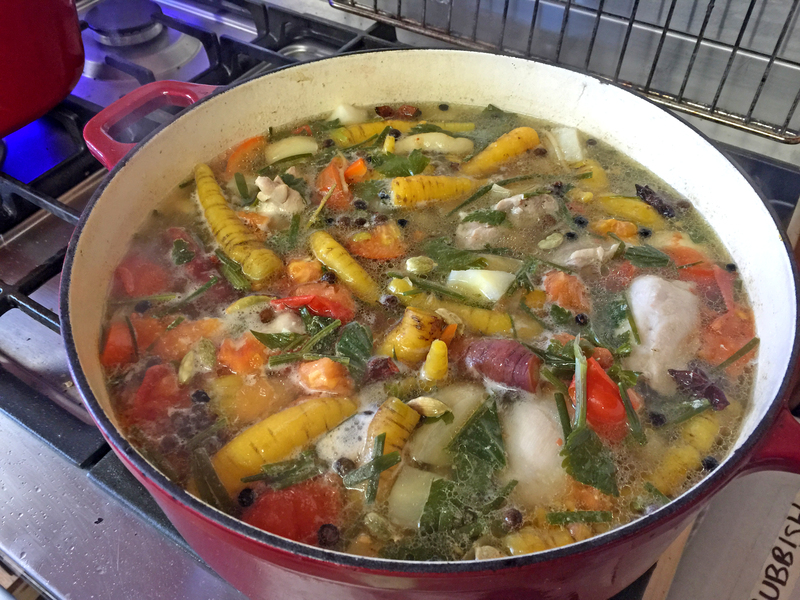 See how to make stock recipe from this site. 6 Free range Organic Chicken thigh fillets. Fresh vegetables straight from the garden (you can amounts can vary the vegetables and amounts depending on what you have available). carrots, pumpkin, sweet potato, green tops of spring onions, chives, sage, oregano, tomatoes, small celeriac plus a few stalks, small long red chilli, salt, fresh ground black pepper, 1 whole star anise,teaspoon of turmeric. Brown off the chicken thigh fillets in a heavy bottomed pan. Then add the chives and green tops from the spring onions and sauté until tender. Deglaze with the stock and add the rest of your ingredients. Bring to the boil and lower the heat so the liquid is at a very slow simmer. Place a lid on the pan and continue to simmer for 2 hours.